Again, one of those tutorials which have been done to death on YouTube, but maybe I’ll be lucky and some of you won’t have seen it already. 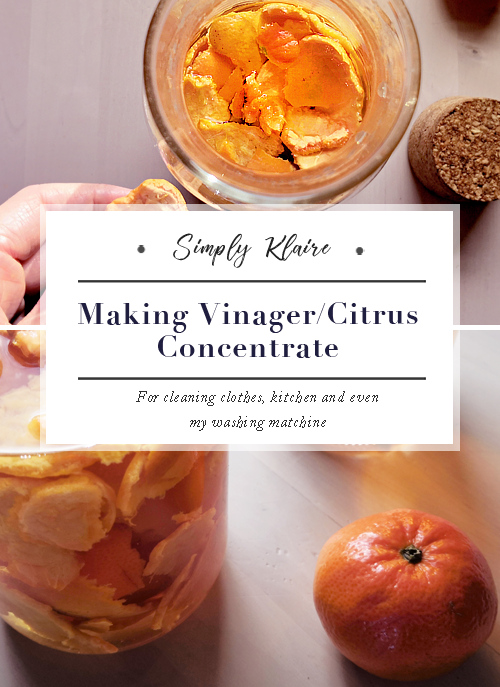 If you haven’t, today I’m going to show you how to make a citrus vinegar concentrate for cleaning. 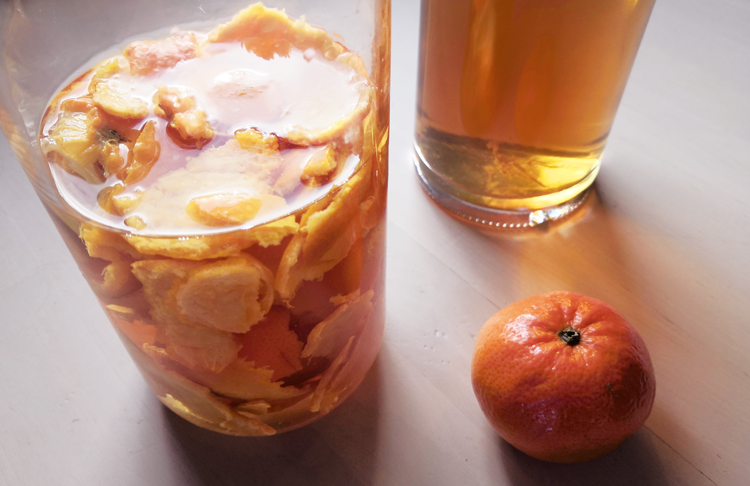 You just take the peels of any citrus fruit; lemon, tangerines, limes, oranges, put the peels in a bottle of vinegar and let it sit. 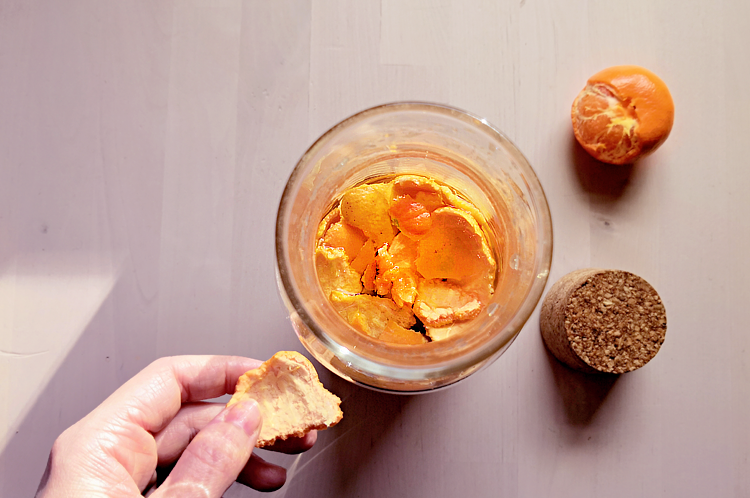 What I normally do is have a half-full bottle of vinegar on the sideboard, and each time I eat a satsuma or orange I drop the peels into the bottle, close the lid, give it a shake and leave it. 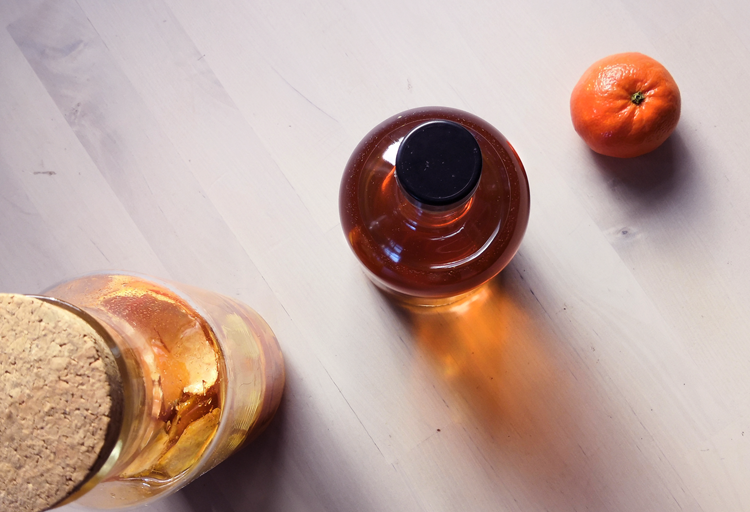 I’ll leave it until the whole bottle is packed full of peels – a process that can take up to a month and a half – and by that point, the liquid inside is a syrupy orange liquid. The vinegar smell is pretty undetectable too, unless you stick your nose right over the bottle. If the smell of vinegar is something you really can’t stand then I’ve found lemons are the best citrus fruit for completely covering the vinegar smell. If you want you can even be adventurous with it and add rosemary or a sprig of mint into your jar of vinegar for a few different scents, though I normally stick to just citrus peels. What Do I Use It For? De-odoring tough smells – like sweat – from clothes. Once a month I’ll put my washing machine on a rinse wash with two tablespoons of the citrus concentrate in it to keep everything running smoothly. 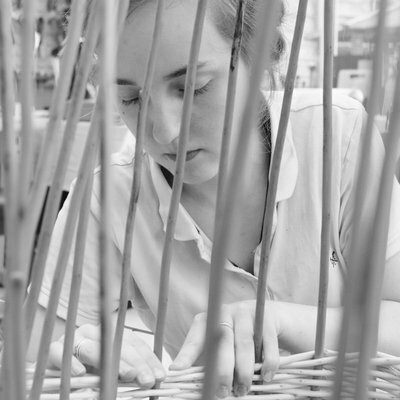 I found that when I started doing this the washing machine functioned so much better. I have quite an old second-hand washing machine, so anything I can do to make sure it functions efficiently and lasts a little longer is fine with me. Whenever I use it to clean stainless steel I always make sure that everything has been dried thoroughly, if I leave it to sit I do run the risk that over time I could corrode the metal a bit, so what I normally do is spray some of it onto a cleaning towel and then wipe down the sink. For de-odorizing and whitening clothes, all I do is add a tablespoon of the concentrate to the wash along with the washing liquid, put the cycle on and let it do its thing. Nice and simple, and as an added bonus the clothes have a nice orange smell to them too.